I took this picture around 7:00 Monday morning. I saw the clouds as I was looking through the window. They looked so pink against the blue sky that I had to have a picture, so I grabbed my camera and went out on the patio. Then I noticed something that I hadn’t noticed before; the electric lines and telephone wires. 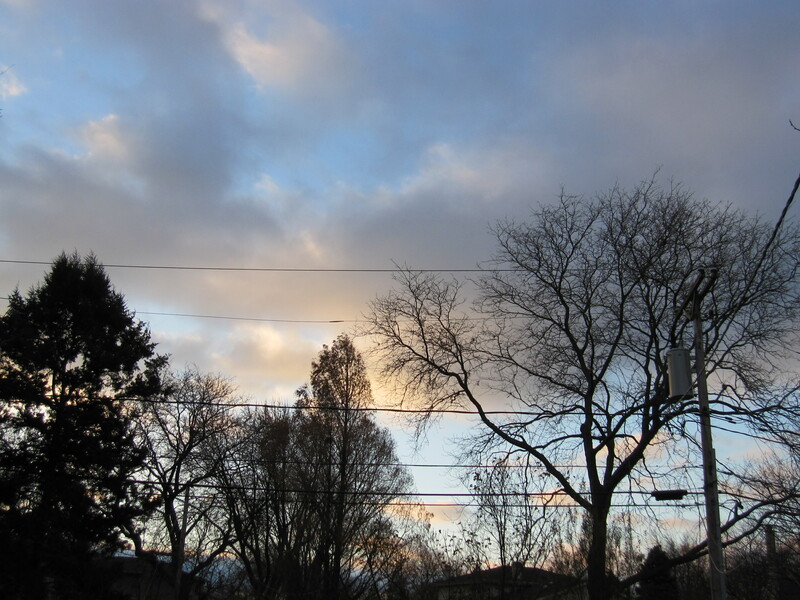 When I looked at the trees and the sky in the my backyard, my mind took away the lines; they were erased; edited out. But when I looked on my camera screen, they were still there, dark and bold and in the way. My mind is pretty good at editing out what I don’t want to see. The negative traits of the motorcycle-riding boyfriend my mom wanted me to break up with. The mistakes I made as a young teacher. The bad decisions I made when I drove 400 miles to visit a different boyfriend and ended up with a broken car window in the middle of March. Those editing skills come in handy, too. It’s not all bad. Parents naturally edit out the sleepless nights and the difficulty of parenting a newborn, and then go through it all over again. Disagreements between husbands and wives need to be edited out, or there would be an even higher rate of divorce. Loving your neighbor as yourself demands some editing. What telephone wires do you edit out of your life? I have to answer this literally that once I did an old-timey photo shoot with a woman and her horse in sepia toned film, and she wanted me to edit out the telephone wires from the photo to make it more authentic! Oh, that was fun. And I edited out the first trimester of my first pregnancy, or I would never have had a second. By the way, my friend took a photo at dawn today and it was of two moose in her yard!! I can’t even imagine trying to edit out wires! That must have been a nightmare! I love moose! My cousins live in Alaska, so they send me pictures of moose in their yards. Where does your friend live? I’m afraid of them, though…they are really big!